So… you are thinking seriously about going after the Road Trip of a Lifetime… and maybe you are having anxiety issues thinking about all that could happen. I’ve said this before: Yukon Do It! When Kaye and I made our epic journey towing our 28-foot fifth wheel, we had our copy of Mileposts and our paper maps in the truck cab and referred to them constantly… and everything went just fine. We didn’t have any problems, going or coming. But it would have been so much easier if we had had the piece I am writing for you right now — a daily guide that would connect the dots from Point A to Point B each day. Well here it is. First of all, make sure your vehicles are in good condition. Have a mechanic replace any worn belts or hoses and change the oil in your tow vehicle. Tires should be in like-new condition all the way around with a good spare on hand. Take a supply of cash along with your credit cards which may or may not work at some road houses. There are ATM’s in a few spots along the way delivering Canadian currency, of course. Get used to navigating without your cellphone. You are not likely to have service except in a few towns. Weak wifi can be found at a few RV parks so each night you can plot your map apps for the next day (GPS may work when wifi doesn’t). 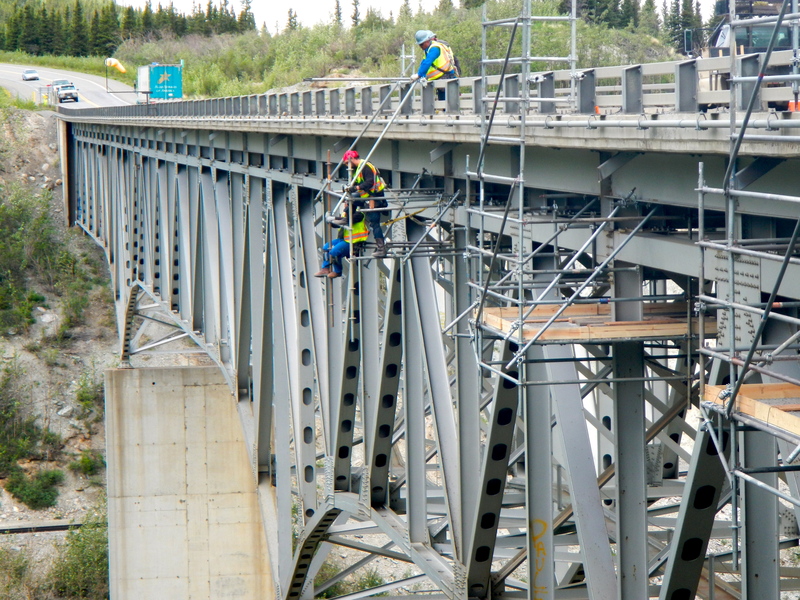 The official Alaska Highway begins at Dawson Creek in northern British Columbia. 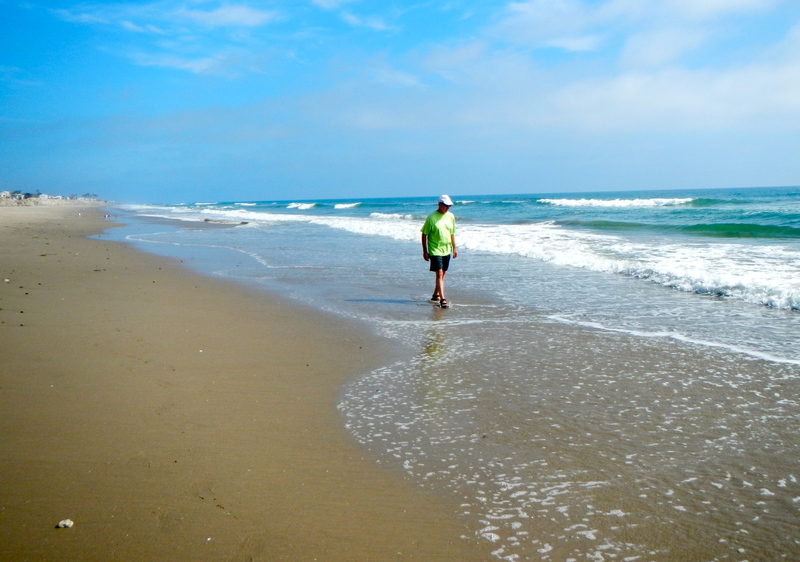 When we did it we had to drive 1,900 miles from Ventura, California and it took us 8 days. Just to get to the START of the Alcan. 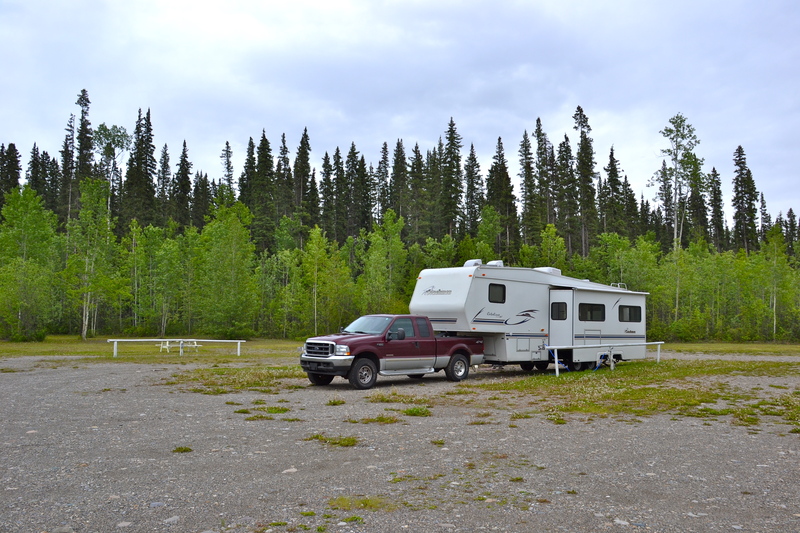 We stayed at Northern Lights RV Park on the hill west of the town of Dawson Creek. The official start of the Alaska Highway, mile zero. Day 1: Dawson Creek to Fort Nelson. 282 miles. Stock up on provisions before leaving Dawson Creek; you won’t find another good market for several days. Fill the tank, then drive your first 101 miles to the Esso at Wonowon, BC. Fill up again. 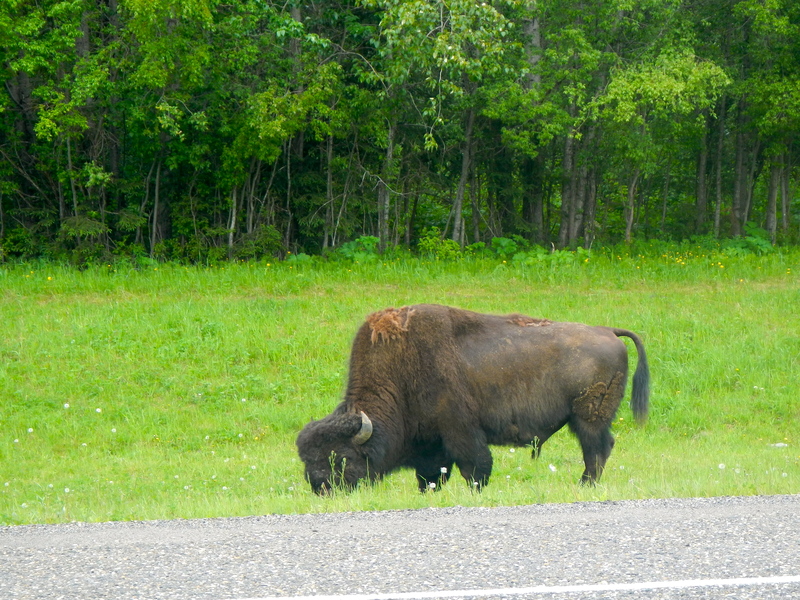 Drive 181 miles over easy hills and through forests on wide open highway to Fort Nelson. We chose the Triple G RV park for our overnight. The power grid ends at Fort Nelson. We passed roadhouses that had been closed, some for a very long time. Fill up the tank and head uphill from Fort Nelson. You will be topping a high pass a couple of hours in; remember to engine brake – downshift to second gear – on the downgrades to save your brakes. This section takes awhile if you are towing a heavy rig; your speed will be down to 35 MPH on winding mountain roads. At 118 miles stop at Toad River for fuel… and lunch if you want. The restaurant at Toad River Lodge has 6,800 baseball caps on the ceiling! 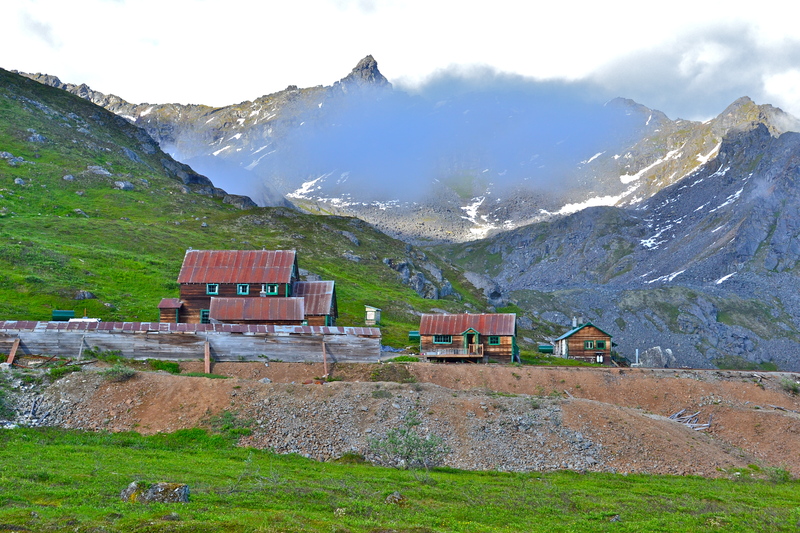 Drive another 107 miles to Coal River Lodge, Muncho Lake BC, a lonely outpost in the wilderness. 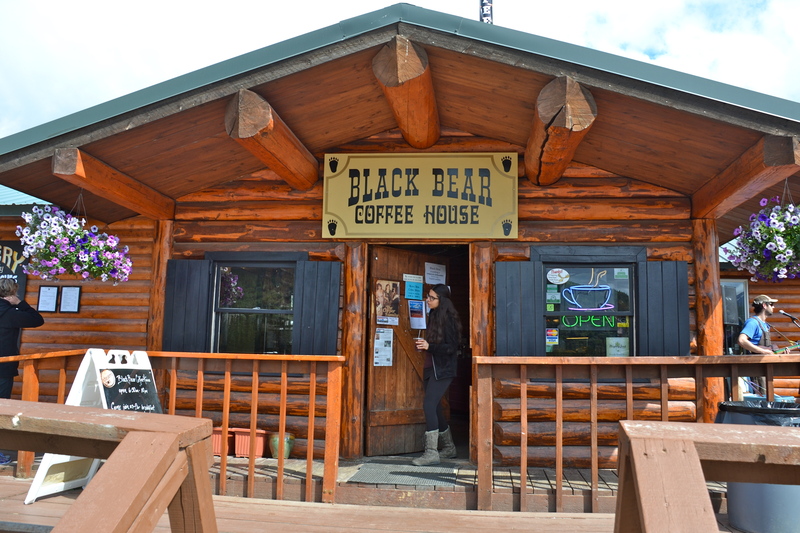 Basic services are available including diesel fuel and at the restaurant inside, their signature buffalo burger at a ridiculous price (everything north of Dawson Creek will be expensive). There is a bare bones campground with 20-amp electricity and a laundromat – all run from a generator onsite. We had the campground to ourselves at Coal River Lodge for the night. 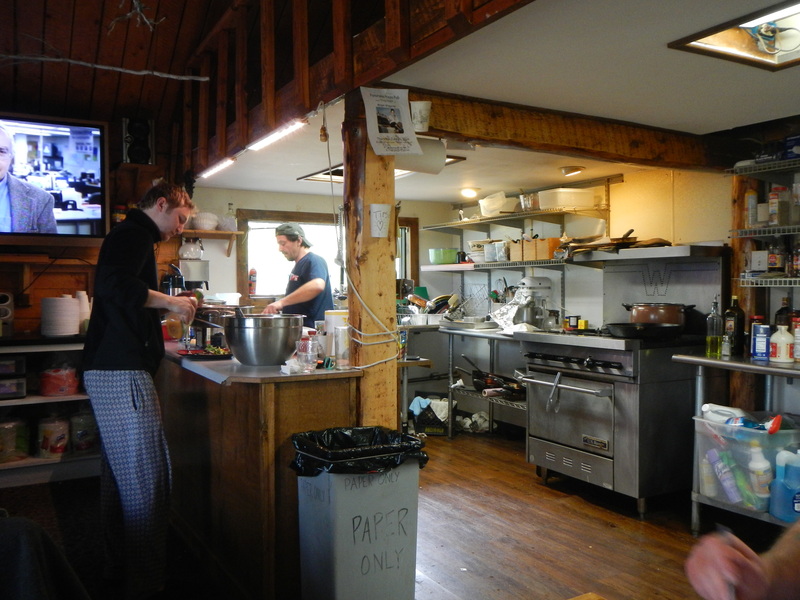 The pies and the buffalo burgers were all home cooked by Donna at Coal River Lodge. 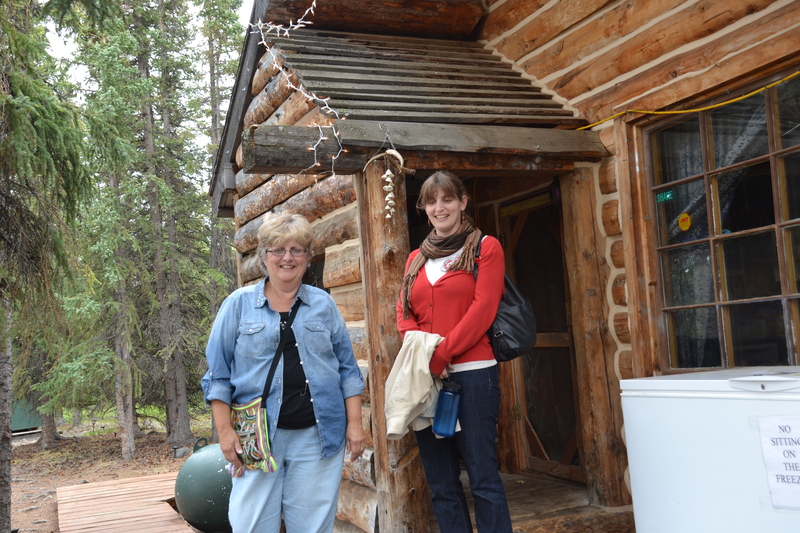 We found friendly owners and had a great time at Coal River, but not everybody will like the spartan accommodations that haven’t been upgraded since the place was built in the 1940’s. If it is not to your liking, fuel up and head for the Downtown RV Park at Watson Lake another 101 miles. Fuel up. This is a more ambitious jaunt, with two stops. First drive 101 miles to Watson Lake (if you didn’t go there last night). Tour the Sign Forest in the middle of town and fuel up at the Tags station at the west end of town where there is a deli with deep fried delights and a little store. You will be criss-crossing the BC/YT border a couple of times today. We added our sign to 70,000 others at the Sign Forest at Watson Lake, YT. 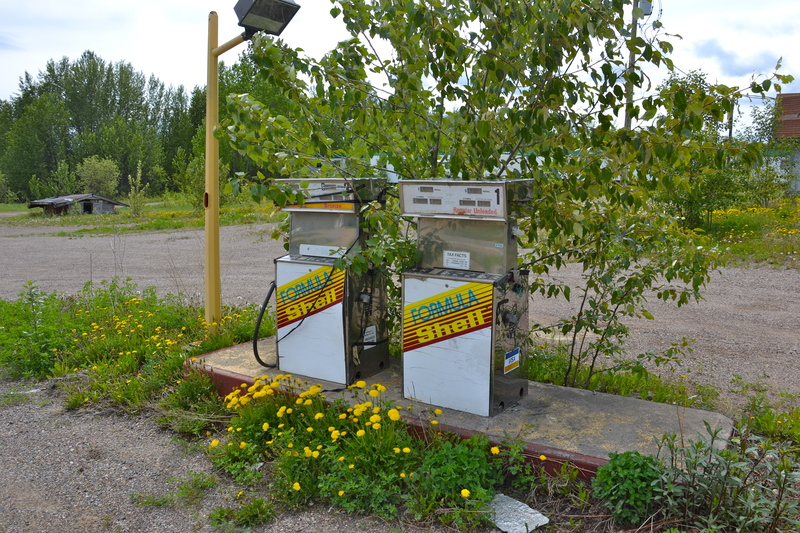 Drive on through the forests and hills to Teslin where you can fuel up again at the Yukon Motel & Restaurant (ATM) or Mesutlin Trading Post. Then on to White Horse and the Pioneer RV Park where you might get wifi. If you have any mechanical issues, you might find help in White Horse. The road mostly follows the valleys between the mountains and is a relatively easy drive. 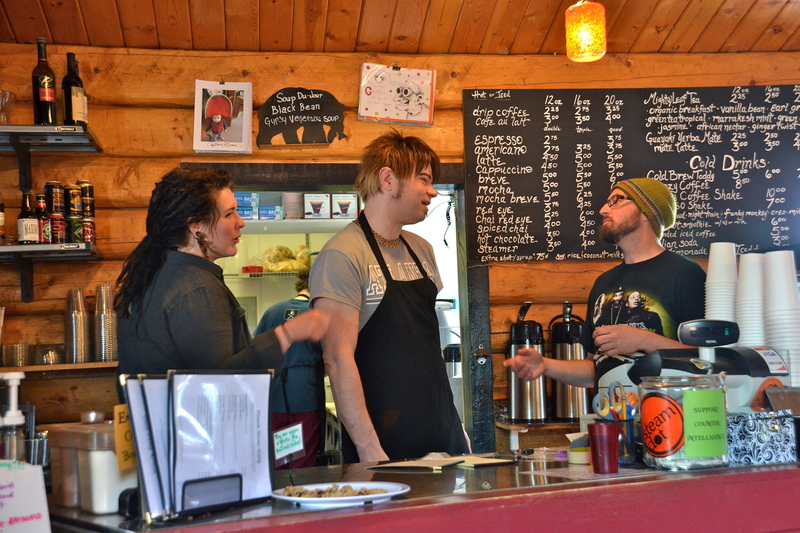 Fuel up and head west to Haines Junction. We experienced some awful roads and construction in this section, but maybe it is all fixed by now. Fuel up again and continue to White River and the Yukon Lodgings Campground which is easy to miss on the left after a bend in the road in the middle of nowhere. There is no town (keep an eye on your mileage and watch for it). If you come out of the woods and cross a river and come to Beaver Creek, you just passed it; maybe just stay at Beaver Creek where there is a motel and an almost RV park. Basically a parking lot. There is no end of beautiful scenery along the Alaska Highway. 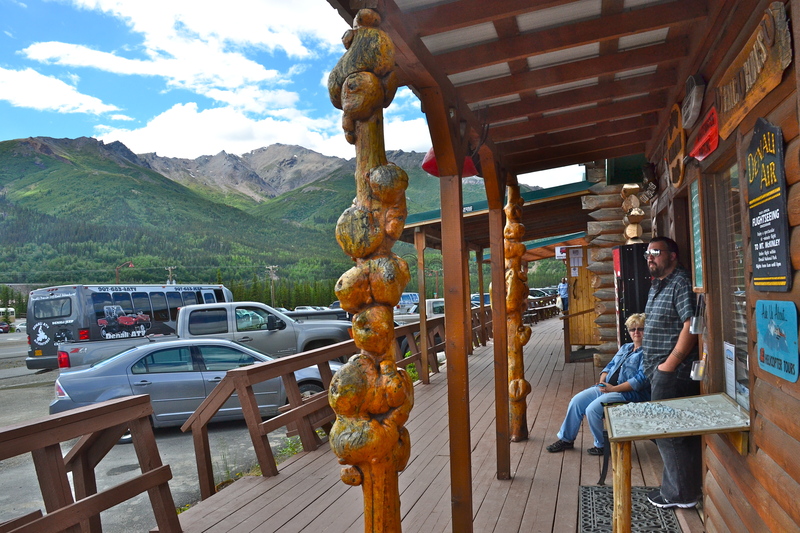 Fuel up at Beaver Creek, then head across the U.S. border and at 142 miles stop at Tok. Fuel up at Chevron or Shell or Tesoro. 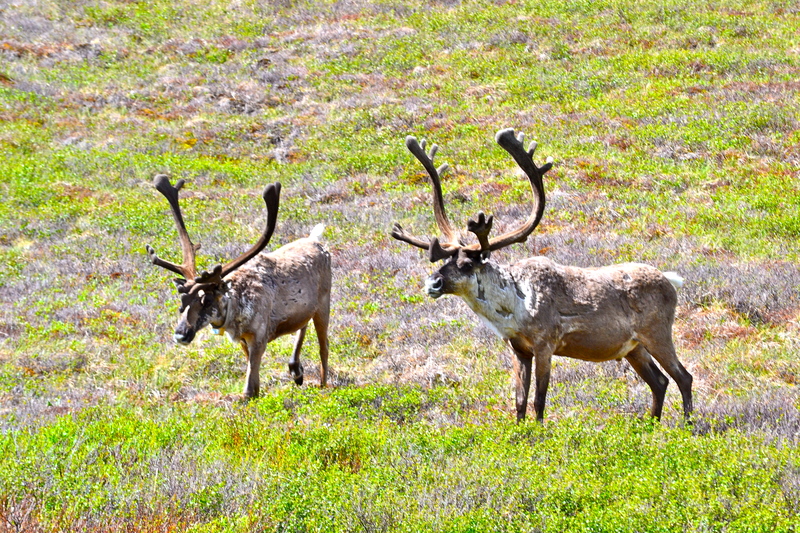 Head west to Delta Junction another 107 miles and maybe camp at the Alaska RV Ranch. Congratulation! You have just completed the official Alaska Highway, approximately 1,365 miles! If you go southwest through Anchorage, add another 100 or so miles. The Alaska Range escorts you toward Fairbanks. You don’t have to drive over those mountains. 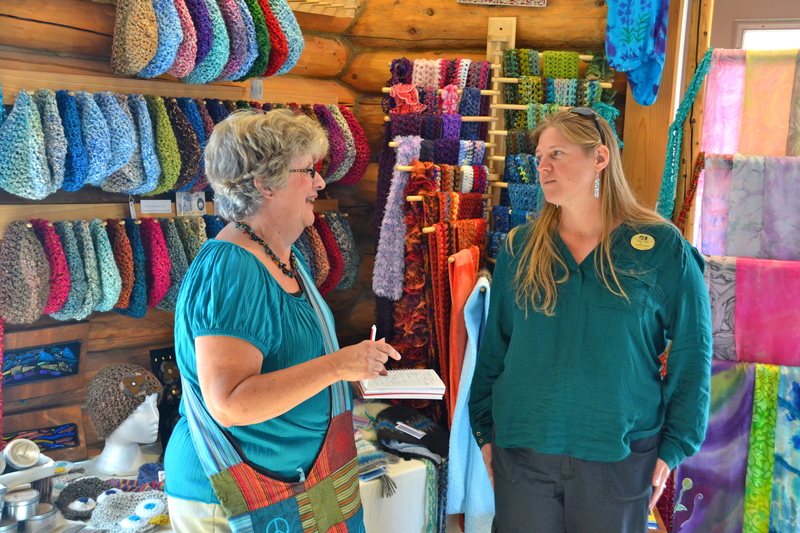 At Fairbanks or Anchorage, stock up on provisions at the Fred Meyer store, because everything at Glitter Gulch (the tourist village a mile from the entrance of Denali National Park) will cost at least TWICE the price and many items will not be available at all! Congrats again, and check this off your bucket list! 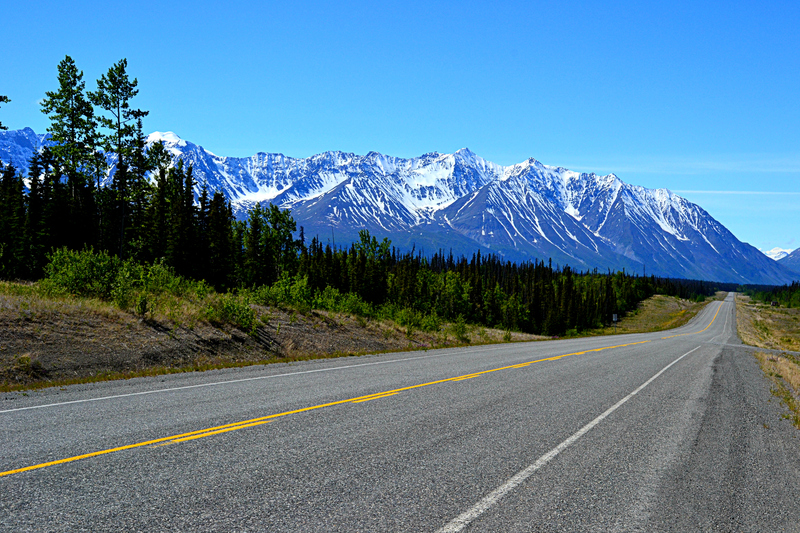 You have covered the Alaska Highway – and beyond, a distance of 1,580 miles (by way of Fairbanks). 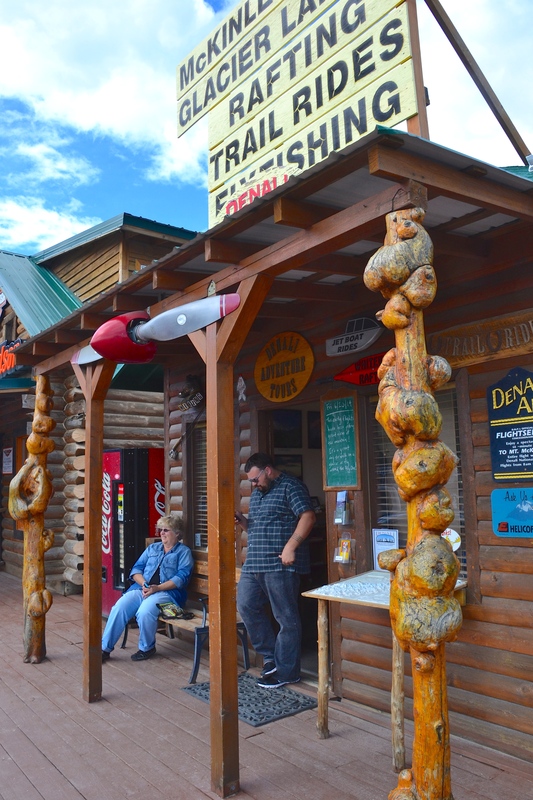 Two dozen shops, outfitters and eateries line the boardwalk at “Glitter Gulch”. We stayed at Rainbow Village RV Park behind the row of log cabin shops on the east side of the highway in Glitter Gulch (affectionately called “the Canyon” by the locals). It is not actually an incorporated municipality so your map app won’t find it. 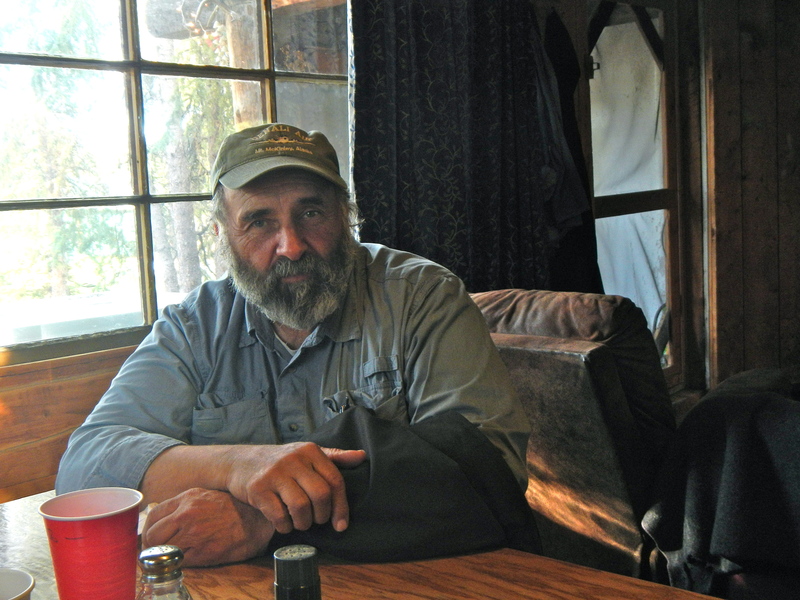 Try searching for Healy, a small town north of the Canyon a few miles, or try Denali National Park; you’ll only be off by a mile. 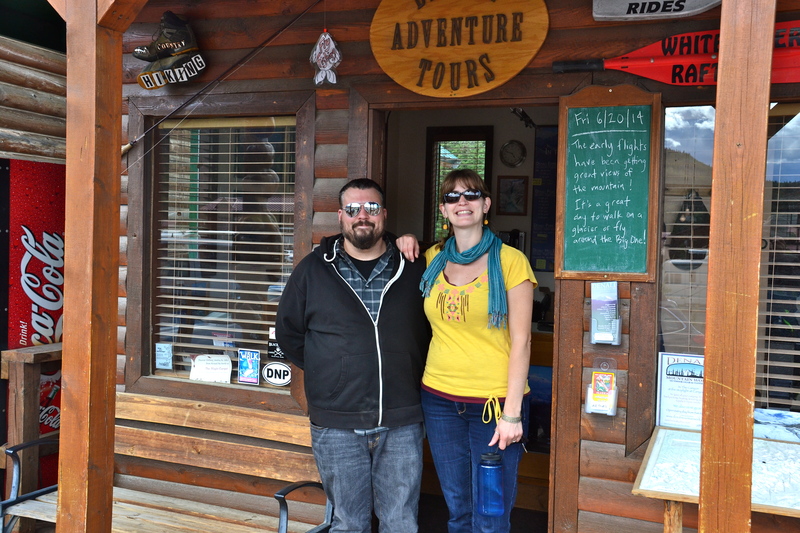 We stayed about six weeks, hiking and biking around the area and venturing into Denali National Park for hiking and sightseeing. Then we took 11 days to make the return trip down to Lincoln Nebraska, then home to Michigan a few days later. We covered about 7,500 miles over all. Now you only have to make it back down! I would love to know what you are thinking. Let me know in the comments below. 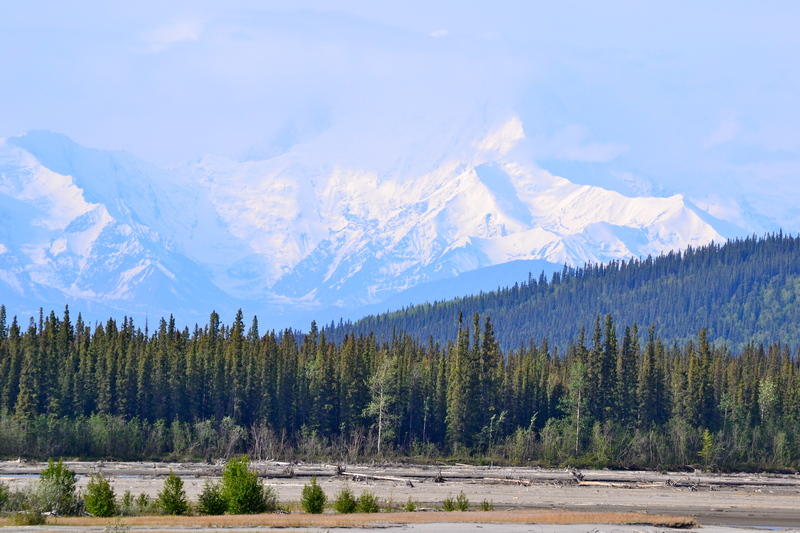 Denali – the mountain – is still 90 miles away. Take the park bus for a closer look. Disclaimer: Though I have done my best to update and verify this information since our own trip, things can change from season to season along the Alaska Highway. (We found that even the Mileposts resource was inaccurate at a couple of points.) You are responsible for your safety and accommodations on this road trip of a lifetime! I have lived in North America for most of my life and have only been vaguely aware of the luxurious space in which we live. I became more aware of it while traveling the Alaska Highway last summer. 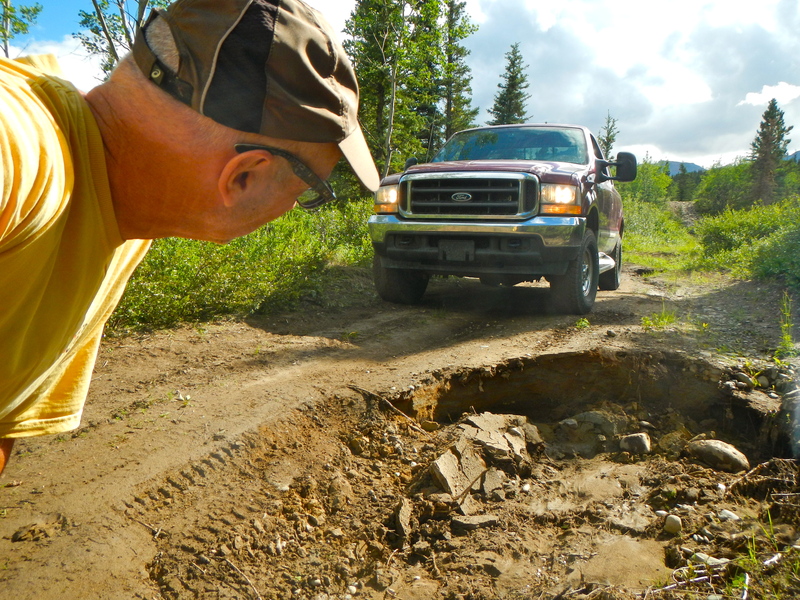 Many times when I was ready to pull back onto the road after a fuel stop or an overnight campground stay, I would look both ways for an opening in traffic… and not see another vehicle in either direction. Really. As far as the eye could see. Nobody. I was repeatedly surprised — and a bit unnerved — at the vastness of it all. The Alaska Highway across the Yukon. Not another vehicle in sight, for miles and miles. Canada has a population density of 9 people per square mile (the US has 48). That amounts to a lot of uninhabited space. I have had anxiety issues in traffic before, usually in the middle of a 5-lane-wide traffic jam in some inner city. But out in the vast and lonely stretches of the Alaska Highway I almost had anxiety issues of another sort imagining what it would take (and what it would cost) to acquire help in case of a breakdown when the nearest town was hundreds of miles away — and there was no cellular service anyway. The reality of our isolation was profound. We were quite truly and utterly alone. And now there’s another sort of space situation that we are facing, but it has more to do with elbow room than the availability of roadside services. After four years of downsizing, first from a 10-room house to a one-room log cabin, we have finally sold both the house and the log cabin on our 30-acre property of 42 years and are hitting the road in a 29-foot fifth wheel. 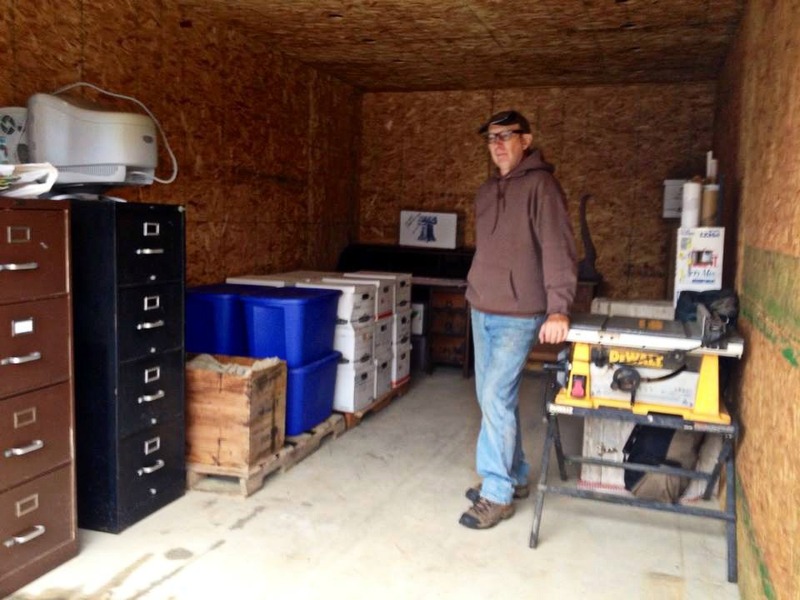 Fortunately, we have already tried it out for awhile, traveling the country for the last year, but we still had the Michigan property and plenty of storage space for our stuff. We have started moving the last of our stuff into storage. We were able to be extravagant about what we kept while sorting through our lifetime accumulated stash, because we had enough room to store everything. 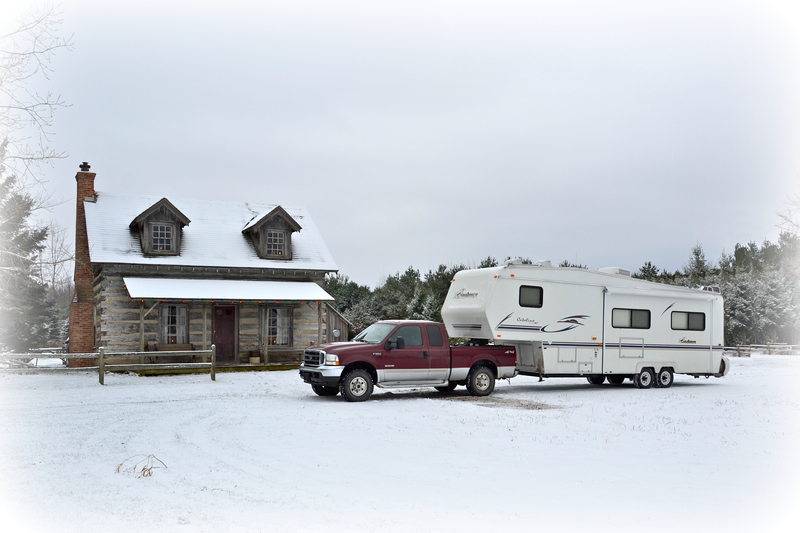 We are moving from the log cabin into the RV for the next few years – and leaving snow behind. So we are moving the last of our keepsakes into one of those self-storage units and will inhabit a tiny mobile space for the next few years. They say that that sort of close co-habitation will either cause two people to bond inseparably… or make them kill each other! Our salvation from cabin fever has always been the great outdoors. We have lived in rural Michigan for most of our adult lives and could safely walk or bike the side roads or the pathways and lanes on the property. Shoot, I had a private route mapped out — and mowed — for jogging a mile without even leaving the property. But part of our reason for selling the place is the brutality of the Michigan winters. The cold and ice and snow brought about a virtual house arrest as it were, trapping us inside for a third of every year. For two active retirees who like to get out and walk several miles every day, that’s not good. And we are doing something about it. We are heading south during the wintertime. Now we’ll be looking for new open spaces, new bike lanes and boardwalks and walking trails in every new place we live over the next years, hopefully in places where we need not worry about slipping and falling on icy roads or sidewalks. We’ll be looking for other extravagant spaces. Nature trails and wildlife areas and rail trails and beaches. Especially beaches. I loved the beach at Seacliff, California last winter — entirely unaffected by the Polar Vortex. Because Americans really do enjoy an extravagance of space. 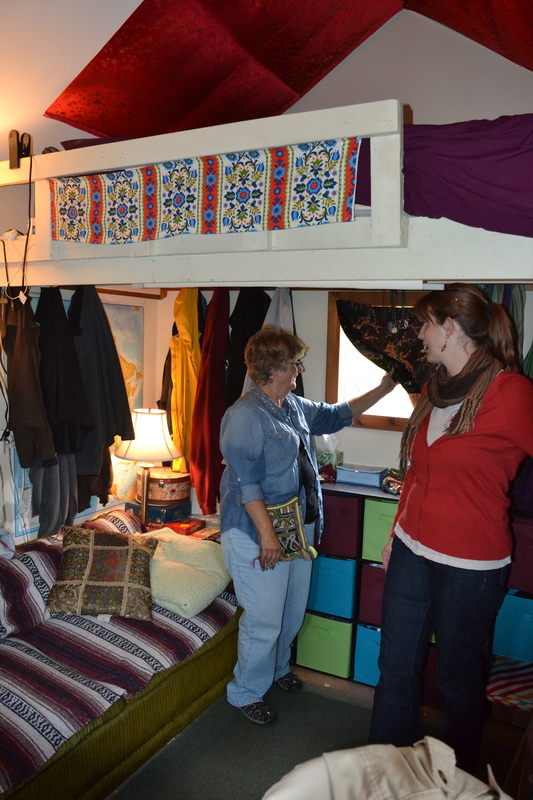 Even RV-ers living in their highly efficient but tiny mobile spaces. 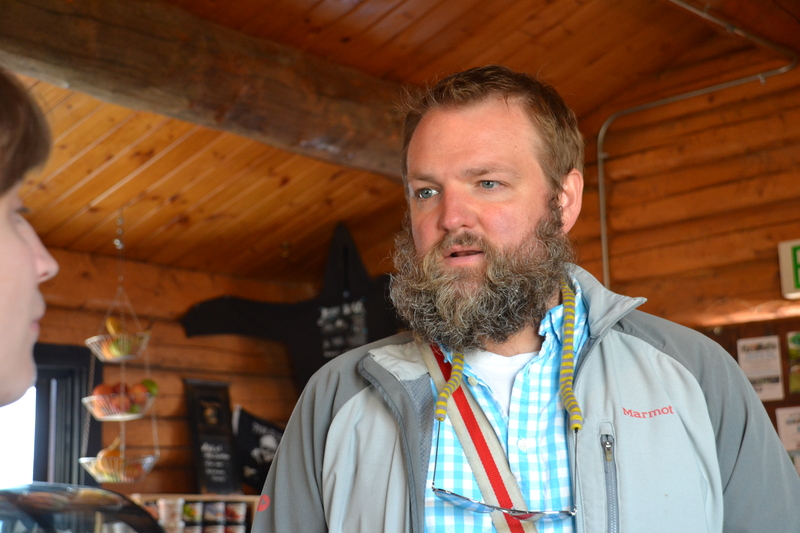 Alaskans are only half civilized… and proud of it. The call of the wild includes the lure of wild wide-open spaces, but it brings a lot of inconvenience for the outsiders from the lower 48 who are used to their perks. 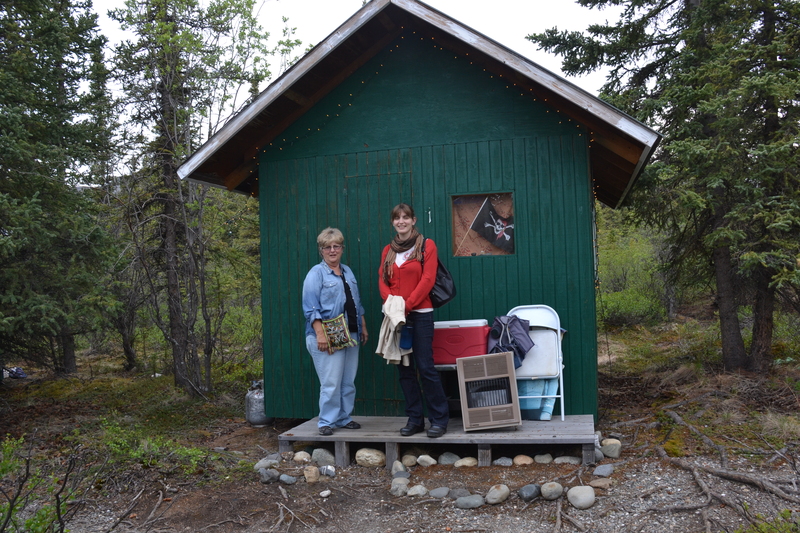 While camped at Denali for the last five weeks Kaye and I have had to accept that we won’t have a good internet link, and for me that has meant a long silence with regard to my travel blog. I haven’t posted because I simply couldn’t get online for much of the time. Anyway, we departed Denali yesterday for the 4,000 miles trek back across the Alaska Highway to Michigan and plan to take about three weeks doing it. 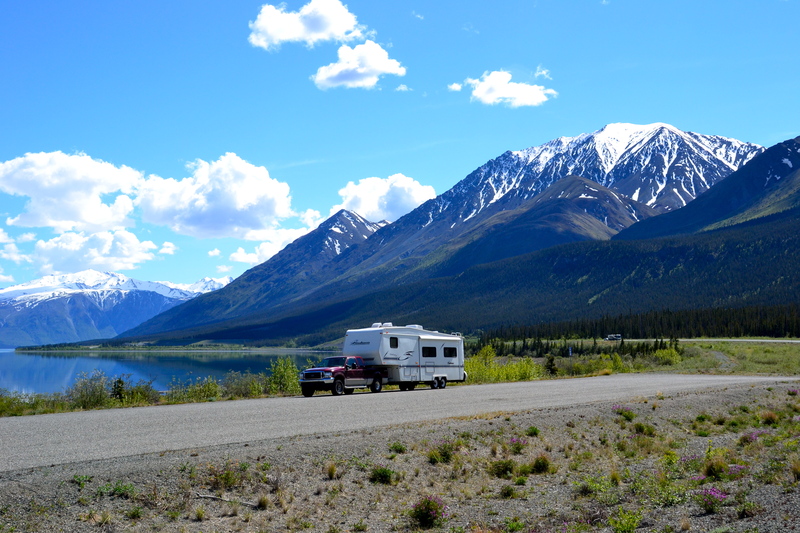 Our first stop near Anchorage provided a good internet connection, so I’m logging a quick post to let everyone know we are on the road again and will likely not be posting very often while heading across through the Yukon and northern Canada. I am planning to write some more extensive reviews after arriving back in civilization. 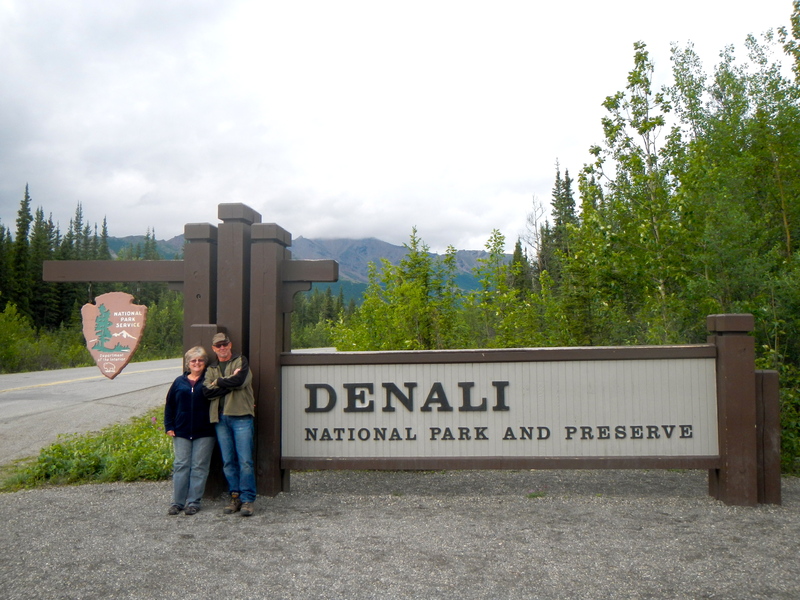 Bob and Kaye at the entrance to the 6 million acre Denali National Park and Preserve.